The house where laws are made and debated. Mark Robinson is Cleveland's representative in parliament. 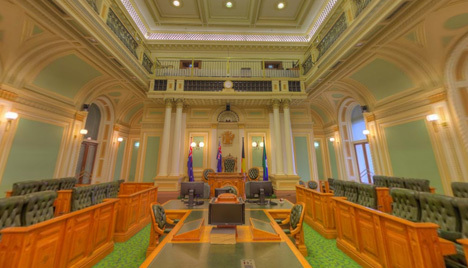 The Queensland Parliament is a unicameral parliament, consisting of the Legislative Assembly of Queensland (the Lower House). The Legislative Assembly is comprised of 93 Members who are directly elected and each represent a Queensland state electoral district. The Queensland Constitution declares that the maximum term of a parliament is three years. Parliament House is the premier heritage building in Queensland and is open for free guided public tours on week days (except for public holidays). Parliament House is located at the corner of George and Alice Streets in the Brisbane central business district and is surrounded by the City Botanic Gardens, the Queensland University of Technology Gardens Point campus and the Brisbane River.